The XW-P1 Drawbar Organ mode lets you combine the essential ingredients of a classic organ tone. 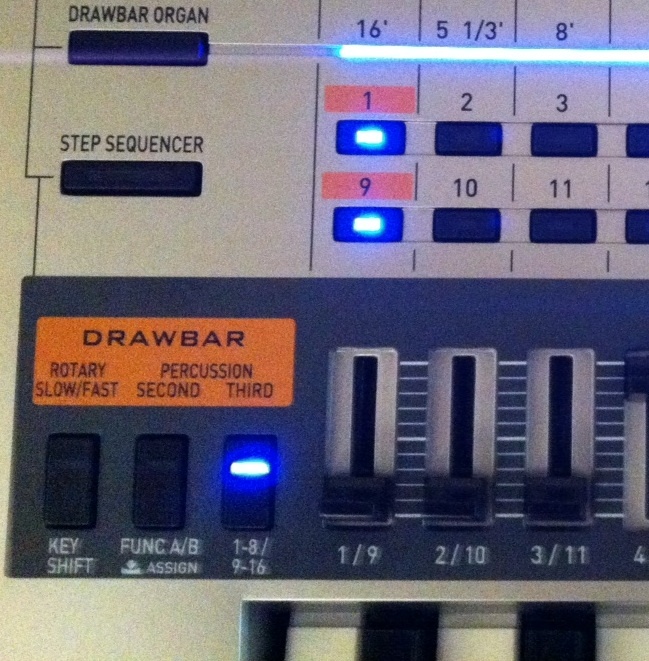 In Part 1, we discussed drawbars and what they do, and in Part 2, we covered how to create different drawbar settings on the P1. It doesn’t stop there; here we’ll go over the next components and finishing touches to get a great organ sound. Just like a B-3, you can add a percussive tone to the organ sound (either the second or third harmonic), by pressing one of the orange-labeled buttons while in the P1’s Drawbar Organ mode. In TONE mode, select preset DRW: P:003 “Perc. Organ 1”. Play a few staccato (short, detached) notes. Notice the wooden “knock” at the attack of each note. Hold down a note at the bottom of the keyboard with your left hand, and with your right hand, play those same staccato notes. Notice the difference in tone: those right hand staccato notes sound much mellower, because the precussion sound is missing. The percussion has already triggered on your left hand note and is waiting for all notes to be released before triggering again. This quirk from the old-school organ days can add a cool quality to your melody lines. Since the percussion fires off periodically, it gives the line various accents that are prevalent in classic jazz and soul recordings. However, if you were playing on an old B-3, you might use the second keyboard manual with your left hand, and/or bass pedals, enabling the percussion to trigger more often with your right hand. Since the P-1 has one keyboard, what can we do to get around this? The answer: Create a split in PERFORM mode. We covered how to create a keyboard split here, and the same process applies for our purposes here. PERFORM mode enables us to use one sound from a specialty category. Here, we’ll choose a DRAWBAR organ tone for the right side of the keyboard, taking advantage of the percussion effect. For the left-hand side, we’ll choose another organ sound from the PCM section. For a left-hand organ bass, try PIANO:P:6-3 “Click Organ”. Note that “key click” on an organ is not the same as “percussion”. Key click is more or less a side-effect of the tonewheel technology used at the time, and its amount varied from organ to organ. This particular preset has a nice, low, fundamental sound suitable for bass lines. Obviously, you could choose any of the PCM tones here, including basses from the GT/BASS banks as well. If you don’t need bass, you can simulate a second organ manual by choosing a complimentary organ sound such as PIANO:P:6-2 “Tremolo Organ”. In EDIT mode, after choosing the sound, go to ZONE PARAM, scroll down to “Oct. Shift”, and try +1 or +2 to put it in a suitable range. Since the PCM engine operates independently of the DRAWBAR ORGAN engine, the left side of the split will not trigger the percussion, and your right hand melodies will have a more authentic B3-sounding quality. Coming back to TONE mode, we can further enhance the sound with vibrato and rotary effects, and more. Next time we’ll cover how to control these effects in real time, and how to apply some of the P1’s many other DSP effects to take the organ tones to some unexpected directions. This entry was posted on June 28, 2012 by Tom Brislin. It was filed under Drawbar Organ, Performance Mode, XW Synths, XW-P1 and was tagged with B3, Drawbar, Organ, Percussion, Performance, Split, XW-P1. These are great tutorials. When you do the next article, can you explain how to use the footswitch to control the speed (fast or slow) of the rotary organ effect on TONES? I can make the switch when looking at an organ tone based PERFORMANCE, which magically then makes any organ TONE work in this fashion, but if I power down, that setting gets lost. I would love to make a global setting so that on any organ tone, the footswitch functions at the rotary speed switch. Here’s the reason, sloppy organ technique where I need my left hand to play instead of being located above the front panel speed switch. I guess I really don’t understand how the change in a single performance edit, can then make it work for organ tones, but only during the current power-on session. Also, I would love to use the Harmony Central forums where Mike Martin chimes in, but right now, no matter which computer I use or which browser (including Safari on my iPhone) I get a message that the site is a known malware site and it prevents my looking at the forums. I would like to know if any work has been done to give more control over the overdrive effect? In the first few software updates, the overdrive was way over the top and not appropriate for organ. This is the only tonal disappointment I have with my XW-P1; the transistor overdrive nature of the overdrive, rather than tweakable tube type distortion.